Most orchid hobbyists can’t resist a novel hybrid or really odd species. That is why we are all “out of space”. Even so, we still bring home a new orchid whenever we visit an orchid nursery or orchid show. “Space, is the final frontier” for most of us. What makes growing orchids difficult is the fact that different orchids require different growing conditions and we want to grow them all. Those growing inside, either under lights or on windowsills, are generally used to orienting their orchids to the proper light levels. Orchids requiring high light, e.g. vandas, are placed close to the light, while phalaenopsis that prefer lower light levels are placed near the edge of the light table. There may be seasonal changes you initiate too, brought on by increasing day length or by changing light bulbs to coincide with spring. It’s important to remember that the intensity of desirable wavelengths generated by grow lights decreases as bulbs age, so it is necessary to replace bulbs long before they stop working. In greenhouses too, the location of orchids is important. Besides changes in day length, the sun changes both in intensity and orientation. A perfect location for your bulbophyllums in winter may be too bright in spring and summer. This is the time of year where it may be necessary to revisit the location of some orchids. In my new greenhouse, there are two areas where the change in season has necessitated moving some orchids. What were once cool, shady spots are now very bright. Because space is at a premium in most greenhouses, there are many hanging plants in my greenhouse oriented in layers. Visitors are often surprised to find phalaenopsis and bulbophyllums hanging high in the greenhouse. While they are hanging, they are shaded by vandas or other high light orchids. If you decide to try “layering” in either your greenhouse or indoor growing area be aware that there are other aspects of orchid growing you must consider. Phalaenopsis hanging under vandas would stay too wet in the typical medium used for phalaenopsis, so my hanging phals are potted in coarse lava rock. Vandas and phalaenopsis both love high humidity and heat, but differ in their preference for light and drying tolerance. Vanda roots prefer to grow exposed and be dry by day’s end, while phalaenopsis roots prefer not to dry thoroughly each day. 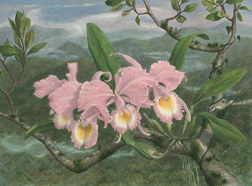 Thus, my vandas are grown without medium and the phals hanging below them are in well-drained clay pots with lava rock. Both are watered most bright days and dry by the end of each day to an appropriate level for the individual plants. There are also some high-light areas in the greenhouse where water is applied at infrequent intervals, especially in winter. Here, various encyclias and C dowiana var aurea hang in pots along with certain cattleya species that prefer to be kept on the dry side. Phalaenopsis and bulbophyllums hanging below these plants would become too dry unless they were treated differently. It is not easy to water orchids hanging below other orchids, so here moisture-loving orchids are potted in a fine bark mix or sphagnum and grown in plastic pots, which keeps them moist between weekly watering. My system works now because I have learned how to do it by trial and error. Many orchids suffered during the learning process. The key to successful layering is to learn which areas dry fastest and which tend to stay wet longer. To practice “layering” successfully you will also have to learn about the requirements of different orchids too.